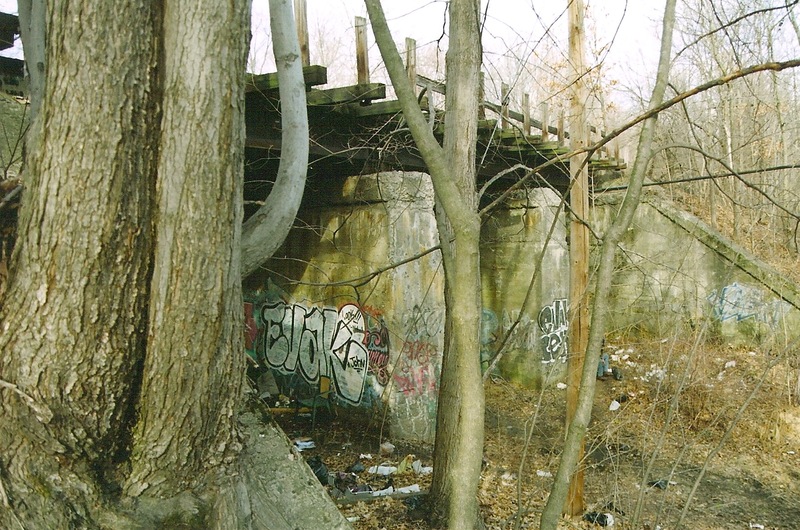 The Maybrook Line (future Dutchess County Rail Trail) used to cross the Hospital Branch (below, foreground) on this bridge. People like to talk about the downfall of American industry, but few of them realize that the remains of its glorious past are still among us. Poughkeepsie, New York used to be a major railroad hub; today it’s a hub for urban decay. While trains still roll north and south along both banks of the Hudson River, there used to be more going on. The most obvious relic is the Poughkeepsie Bridge, now Walkway Over the Hudson State Park. It used to carry the New York, New Haven & Hartford Railroad’s “Maybrook Line” from New England across the Hudson to points west and it’s a pretty spectacular hike. However, the Maybrook is not is not the only abandoned railroad in Poughkeepsie. Poughkeepsie was a meeting point for two mainline railroads, but there was a third, much smaller line sharing the city. The “Hospital Branch” wound its way from the river, up a switchback and through city streets, to the Hudson River State Hospital. The hospital’s power plant received coal by rail, giving the branch its nickname. The line was constructed around 1873 to connect the Poughkeepsie & Eastern Railroad with the Hudson River Railroad. It ultimately served their successors, the Central New England Railway (later New York, New Haven & Hartford) and New York Central, respectively. With the Poughkeepsie Bridge, the New Haven already had a heavy east-west freight line, with a lucrative connection to Pennsylvania coal-hauling railroads at Maybrook, New York. The Central New England’s connection with the New York Central at the small riverside yard (still known as “CNE Yard” today) couldn’t compete, and was gradually marginalized. Nonetheless, Hudson River State Hospital still needed coal, and local industries kept shipping small amounts of freight. The line hung on after its namesake hospital closed, surviving into the 1990s under Conrail. 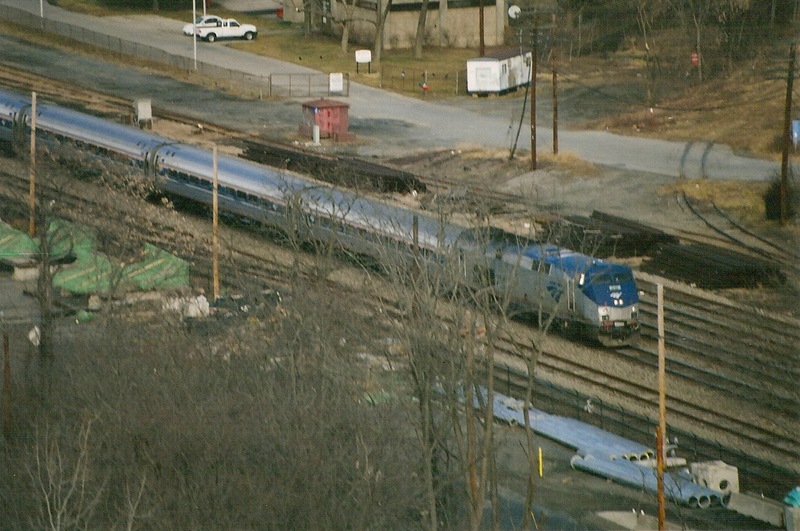 When Conrail’s New York state lines were taken over by CSX in 1999, the new management wanted to divest itself of the Hospital Branch. There was a short-lived attempt to revive the line as the New York & Eastern Railroad, but political opposition killed it before any trains could run. The Maybrook Line roadbed crosses over the Hospital Branch just east of the Poughkeepsie Bridge. CSX received permission to abandon the Hospital Branch in 2005, and the rails were lifted. The City of Poughkeepsie is currently seeking funds to turn the four-mile line into a rail trail. Downtown Poughkeepsie isn’t the most scenic place to ride a bike, but the Hospital Branch should attract plenty of ghost train hunters. No visible work on the branch has been done, but the roadbed is still intact and walkable. The Hospital Branch forms a large “T,” running north-south from Smith Street to the Hudson River State Hospital. It crosses under the former New Haven Maybrook Line (soon to be Dutchess County Rail Trail) just east of the parking lot for the Poughkeepsie Bridge/Walkway Over the Hudson. At the Hospital, the line goes down a switchback to reach the river. The spot where the roadbed diverges from the active Metro North/Amtrak line just north of Poughkeepsie station can be seen clearly from the bridge. An Amtrak Empire Service train heading southbound into Poughkeepsie. The Hospital Branch curves to the right just above the locomotive. The last mile or so of roadbed between the bridge and the current end of the rail trail is being paved, and when it’s finished it will cross over the Hospital Branch just as the Maybrook Line freight trains once did. For now, the roadbed is still passable, and the former connection with the Hospital Branch is only a short hike from the Walkway parking area. 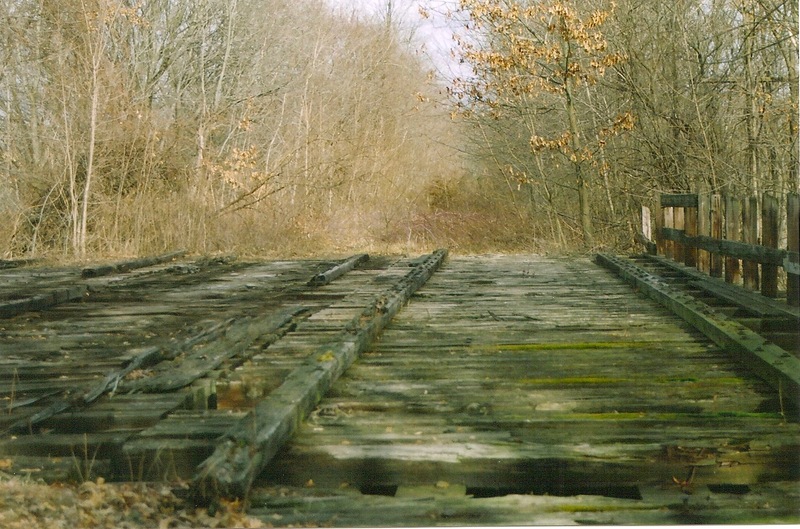 A wye track used to connect the two lines, but modern explorers will have to climb down the embankment from the former Maybrook Line and walk under the bridge to reach the Hospital Branch. Those willing to make the trek will find a forgotten piece of history. It’s still an overgrown railroad right-of-way running through some seedy neighborhoods, so if you go, keep your wits about you. Also, watch out for broken glass: teenagers and homeless people like to use this secluded site for late night drinking. Local police probably won’t appreciate trespassing, but the former railroad is pretty well hidden. Hudson River State Hospital is a historic site in its own right, but it is heavily surveilled. This entry was posted on July 13, 2012, 2:09 pm and is filed under Old Stuff, Places. You can follow any responses to this entry through RSS 2.0. You can leave a response, or trackback from your own site.